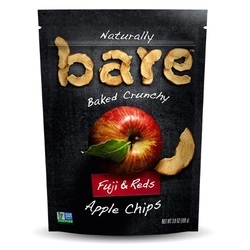 Bare fruit bake-dried Fuji apple chips are baked, not fried, not freeze-dried. All natural, delicious, healthy snacks you and your family will love. Low calorie, high fiber, naturally sweet. Our ingredients list is simple: fruit.